Northern Ireland’s Alan Dunbar and Austrian Matthias Schwab will contest the 36-hole final in the British Amateur on Saturday at Royal Troon. At stake is the Amateur Championship Trophy, a spot in this year’s British Open at Royal Lytham & St. Annes and in next year’s US Open and, traditionally, an invitation to the Masters Tournament at Augusta National. Dunbar is looking to become the first Irish player to win since Brian McElhinney in 2005 and Schwab can become the first Austrian to ever lift the Amateur Championship trophy. Schwab is six years Dunbar’s junior at age 17. He won the 2010 Austrian Amateur and has made the cut in the last two Austrian Opens on the European Tour. 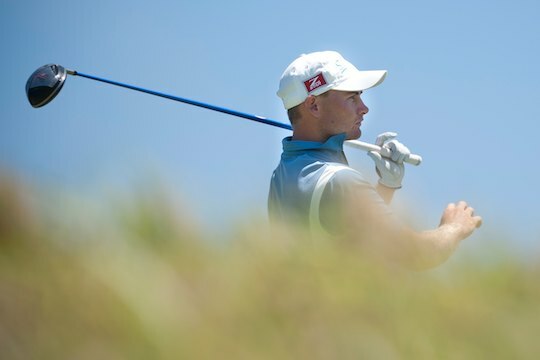 In the morning’s first quarter final Matt Stieger’s aspirations of securing back-to-back Australian victories, after Bryden McPherson won last year at Hillside Golf Club, were dashed by Paul Ferrier from Scotland with a 4&3 victory over the 2011 Australian Amateur champion. “Overall, I’m pleased with the result,” said Stieger. Ferrier’s amateur was then brought to a halt by Dunbar, who raced to a two-hole lead over Ferrier after playing Royal Troon’s front nine in 33, 3-under-par. However, consecutive double bogey sixes at 10 and 11 brought the match back to all square. Dunbar turned the contest around by winning the 12th with a birdie and 13th with a par for a 3&2 win. “I played well on the front nine and holed a few putts, but 10 and 11 were shockers,” Dunbar said. Dunbar was a member of the winning Great Britain & Ireland in last year’s Walker Cup at Royal Aberdeen. He won two out of three matches to help defeat the United States 14-12. Schwab made the cut on the mark of 3-over-par, but has made the most of the match play stages. He progressed to the final with a 2-up victory over Scotland’s Jack McDonald. “There was a lot of nail biting about qualifying, so I was just happy to make it into the match play stages,” he said.